Home › Marking and assessment › What does the update to Turnitin mean for students? Turnitin is the software used for providing marks and feedback and checking for similarity on text-based assessments as part of the e-submission system at the University of Sussex . Current students will most likely have used Turnitin at some point for submitting their work, viewing feedback or as a tool to help develop their referencing skills. However, for new students, this will likely be an entirely new experience. All students should be aware, that for the 2017/18 academic year, Turnitin has introduced a number of significant changes to their software with their recent ‘Feedback Studio’ rebrand and update. If you are unfamiliar with Turnitin or e-submission, then please see the resources and guidance on the Technology Enhanced Learning website. For a brief overview of the updates, continue reading. The Originality report has been renamed the Similarity report. Turnitin is often misunderstood as providing a ‘plagiarism’ detection service. Whilst in truth, it is your tutors who identify plagiarism, as defined by the university policy for academic misconduct. Turnitin has no concept or built-in intelligence for identifying or navigating institutional policies for academic misconduct. It is simply capable of comparing your document against others to highlight similar matching sentences and areas of text – regardless of why it is ‘similar’. To recognise this, Turnitin has renamed this feature to more accurately reflect its behaviour. 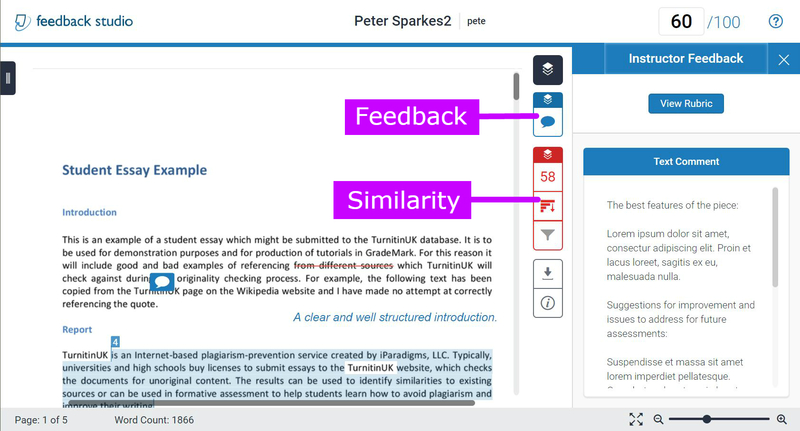 See our Understanding Turnitin Similarity webpage to learn more. All features have been combined into a single interface. In the previous iteration of Turnitin, marks and feedback were presented in a tab labelled ‘GradeMark’. Information from the Turnitin similarity report was displayed on a separate screen known as ‘Originality’. Feedback Studio now includes ‘layers’ which can be switched on or off to customise your display. You will be able to view your summary feedback and rubric forms from the ‘Instructor Feedback’ menu. For more information on viewing your feedback, see the Technology Enhanced Learning web page. As well as having more visibility of your document, and the option to choose what you see. It’s also much easier to navigate between pages in your document using the thumbnail navigation menu. The Turnitin software now uses a mobile responsive design, which means that you will be able to view your feedback and similarity reports across a range of smartphones and tablet devices. Turnitin has taken steps to improve the accessibility of their software to strive towards compliance with modern web standards (WCAG AAA standards). They have introduced an accessible colour palette, keyboard navigation and a text-only report for use with screen reader software. To access the text-only report, press the ‘tab’ key and then enter. Where can I learn more about e-submission and Turnitin? Full guidance on using the e-submission system, including submitting your work, viewing your feedback and understanding Turnitin similarity reports, is available from the Technology Enhanced Learning website.